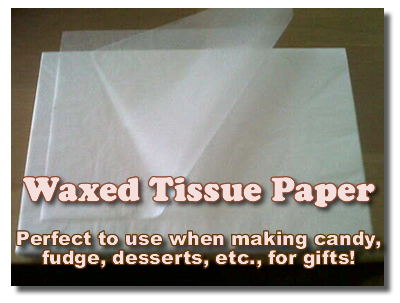 Waxed tissue paper for wrapping fudge, candies, and sweets of all sorts! What kind of paper is used to wrap fudge? I make fudge to give as gifts for the holidays. I have noticed at places that sell fudge they use a very thin transparent paper. It isn't wax paper or parchment paper, and the fudge doesn't stick to it. Does anyone know what the name of this paper is? Would you be referring to glassine wrappers, I wonder? I'm not quite certain what type of paper you are referring to, but if you have a shop that sells fudge locally, why not ask them? They may even be willing to sell you some of their paper for a small fee. Let us know if you find out a specific name for the kind of paper used to wrap fudge there. Meanwhile, you may want to look at the confectioners paper, foils, etc., available at Candyland Crafts. Thanks to a generous reader (Rochelle, who left a comment below), we've got the right name for the paper used to wrap fudge and other confectioneries. How did this wax paper work out for you? I have used regular wax paper on my fudge before, it seemed to "dry" the fudge out tho. I'm really interested to hear if it effected your fudge in any way. I have been using a "professional strength" plastic wrap to wrap my fudge in. It actually works great. Thank you so much for all your help! I was able to find the waxed tissue paper. I really appreciate everyones input in my search for this product! Try this recipe from one of my favorite places (Taste of Home) for Gumdrop Fudge. I'm going to make it, too, in the next few weeks (as it sounded so delish) and will add it to the website, so DO send me some of your photos and thoughts to include on the new page. Thanks for bringing this idea to my attention. Keep me posted on all of your holiday projects. I very much love finding new contributors to showcase here at Chocolate Candy Mall. Thank you both for your help! I really appreciate it. Have you every made a gumdrop nougat fudge? Like the one made by calico cottage. It's a white fudge with gumdrops. I have been trying to find a recipe everywhere and just can't seem to get it right. Any suggestions? Thanks Rochelle! That was a great find and I was able to locate the waxed tissue paper at a really decent price, so I added it above. There are other places where you can order it, but the prices were quite a bit higher. It pays to shop around! This little tip will make it so much handier to create holiday goodies for friends and family and present it in a lovely way. Thanks again! I had the same question. I asked at a local bakery and was told it is waxed tissue paper. I was then able to find "dry waxed tissue sheets". I believe it is the same thing used to grab donuts at the bakery.